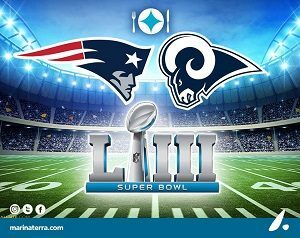 For Super Bowl Sunday on February 3, join us with a group of friends at La Bartina 64 and watch the game on oneof our 10 HD screens. Tables are by reservation only. You can reserve your table in the restaurant or via WhatsApp to the cellphone 622-164-6278. This year, La Bartina will have a giant (2×3 meters) LED screen. 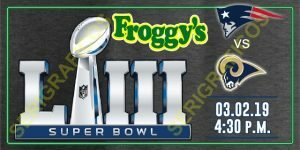 Froggy’s will be showing the Super Bowl on Sunday, February 3. 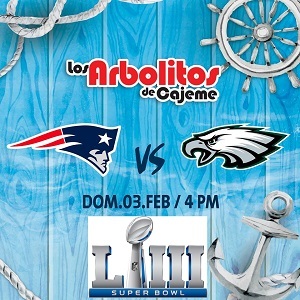 During the game, enjoy national and draft beer for 20 pesos, margaritas for 35 pesos and 2 x 1 pizza. On game day, Maria’s Restaurant will be serving Tony’s homemade traditional lasagna. The meal includes a healthy portion of lasagna, salad and garlic bread for 130 pesos. Tony’s lasagna is from a family Italian recipe that is outstanding and second to none. They’ll start serving the lasagna at 1:00pm until it runs out. All beer will be discounted 20%. They’ll be showing the Super Bowl and all the pregame hype until kickoff. The Country Club will be showing the game and serving the house specialty, fish and chips 2 x 100 pesos, margaritas 2 x 80 and tequila shots 20 pesos. 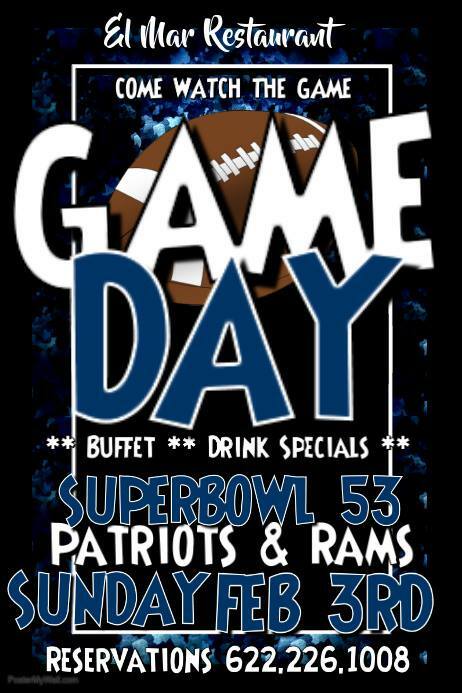 El Mar will be serving a special Game Day Buffet with drink specials. Reservations suggested. Call 622-226-1008 or make your reservations at the restaurant. 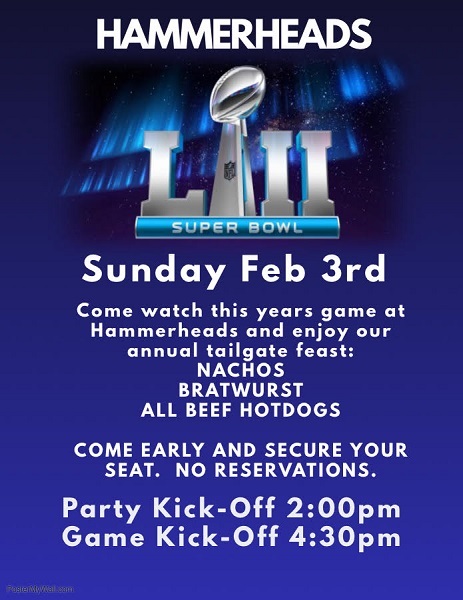 HammerHead’s will be hosting their 5th Annual Tailgate party on Sunday, February 3 with a feat of nachos, bratwurst and all beef hot dogs. Watch the game on one of our 8 large screen TVs. 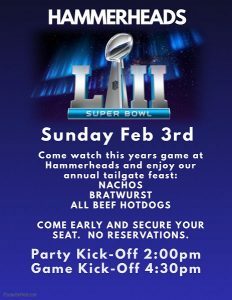 The party starts at 2:00pm and the game kicks off at 4:30pm. Come early to get a good seat. No reservations. 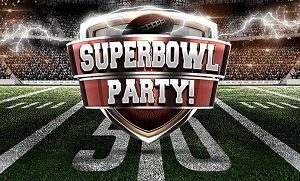 Come to Captains Club for Super Bowl Sunday on February 3 and enjoy Happy Hour throughout the game, as well as complimentary snacks. Join us at El Embarcedero Cocina + Bar at Marinaterra hotel this Sunday, February 3 to watch Superbowl LIII as the Patriots take on the Rams — the game will be broadcast live on our giant screen. We’ll have free snacks during the game. 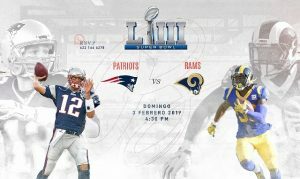 Watch the Patriots battle against the Rams on Superbowl Sunday, February 3 at Los Arbolitos restaurant in San Carlos. 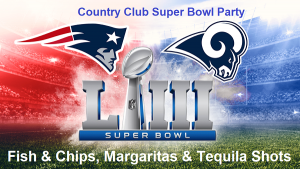 Throughout the game, enjoy 2 x 1 Margaritas and/or a bucket of Tecate Lite for 300 pesos. Bring your friends and cheer on your favorite team at Los Arbolitos! 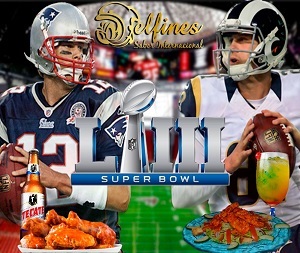 Watch the game at Delfines Bar and Grill on one of our big screen TVs. We’ll have our regular menu available, as well as special boneless chicken and chicken wings. 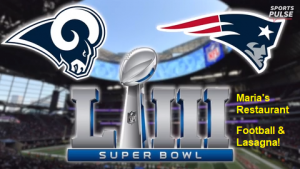 See you on Superbowl Sunday, February 3. 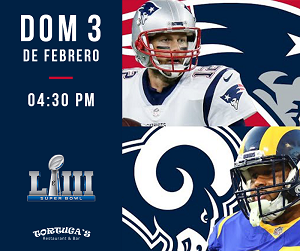 You can watch the Super Bowl on Sunday at Tortuga’s Restaurant and have San louis Back Rib full rack for 350 pesos and national beer for 25 pesos.